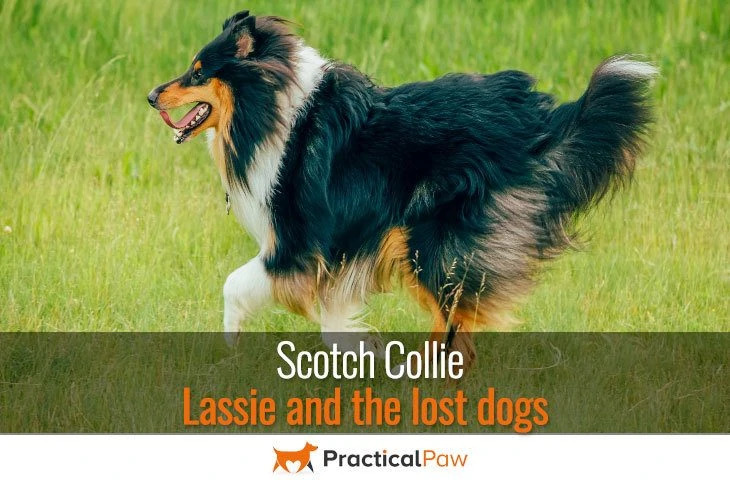 Talk about Scotch Collies, and most people think of Lassie. Although Lassie, now known as a Rough collie shares her roots with Scotch Collies, they are very different dogs. In fact, there is a growing movement to get the Scotch Collie recognised as a distinct breed. The original Scotch Collies were landrace which means that there was minimal interference in breeding. Instead through natural selection dogs developed qualities adapted to their specific environments and needs. The organic development of the Scotch Collie means that unlike modern breeds of dog there is diversity in their behaviour and looks. The easiest way to think of Scotch Collies is to think of them as existing on a scale. Ranging from what we now know as a Rough Collie at one end all the way back to the various looks of the traditional farm dog or Scotch collie. The Scotch Collie is at heart a farm dog. Originating in Scotland, this hardy dog was herder, protector and family member. Scotch Collies were invaluable around a farm and appreciated for their intelligence and ability to know what to do without being told. Sometimes known as the old-time Scotch Collie or old-time farm dog to differentiate them from the modern Rough and Smooth Collie. The Scotch Collie was not a dog bred with intent. Instead, the breed developed over time to fit the diverse roles that it was required to perform. Its popularity saw it imported to other countries and shown at events resulting in the formation of the Scotch Collie club and acceptance into the American Kennel Club in 1885. Eventually, the name Scotch was dropped in favour of ‘Rough’ and ‘Smooth’ in part to differentiate the working dogs from the show dogs. As the breed developed within the new breed standards, the Collie began to change shape and form into the ‘Lassie’ type dog we recognise today. By the mid-twentieth century, the original Scotch Collies were so far removed from the AKC breed standard that their popularity declined, and their population fell. It’s believed that without the Scotch Collie many of the dogs that we know today including the Rough Collie, Smooth Collie, Border Collie, Gordon Setter, English Setter and Australian cattle dog would not exist. So, although the Scotch Collie is no longer recognised by as a distinct breed by the Kennel Club, there is an ongoing movement to bring it back. The Scotch Collie is a medium-sized, well-balanced dog. It ranges from seventeen to twenty-five inches tall and weighing in at around thirty-two to eighty pounds. While there is a lot of diversity in the appearance of Scotch Collies, the overall look of the Scotch Collie is athletic, lean and fit but without bulk. Slightly longer than they are tall, the Scotch Collie is a well-balanced dog. The medium size ears are pointed at the tip and sit erect, partly erect or folded. These dogs have a gently tapering, smooth face with eyes that are most commonly brown. Although blue merles may have blue eyes or one of each colour. Scotch collies have a dense, medium length double coat with a soft underlayer and slightly coarse topcoat. With a distinctive mane, the fur is also longer and thicker around the tail and breeches. Coat colours vary including sable, red, black and white, blue merle and tan. Facial markings are typical as are flashes on feet and tail. Graceful and confident the Scotch Collie is a handsome dog with a keen and intelligent look. The Scotch Collie is highly intelligent, biddable and gentle. Protective of their flock and their family the Collie is a natural defender, herder and hunter. The Collie is Brave in their response to a threat and efficient in ridding their traditional farm homes from vermin. The Scotch Collies natural desire to herd along with their athletic and rugged nature was invaluable in the rough terrain of Scotland. Their obedient personality combined with a strong desire to please makes the sweet-natured Scotch Collie a popular choice both as a working dog and as a family companion. Scotch Collie At its best Sweet, intelligent and biddable. This versatile dog is just as happy as a family dog as they are as a working dog. Bold, but reserved with strangers, the Scotch Collie is responsive with a sensible yet playful nature. Always ready for action but not high-strung this adaptable dog is content to relax when they’re not needed but always prepared for action. Scotch Collie At its worse Over-protective and highly-strung. With a strong desire to control their families and a low threshold for boredom. As a working dog, the Scotch Collie needs plenty of physical activity as well as mental stimulation. At least two long walks a day combined with play sessions and training will keep them happy. The Scotch Collie is a perfect companion if you love the outdoors. They will happily keep pace with you on hikes, bike rides or while you’re jogging. Although ordinarily biddable, gentle and devoted an under-exercised or bored Collie is easily frustrated and can quickly develop unwanted behaviours. They can become destructive and resort to ‘nipping’ in the wrong family as well as being persistent barkers. The Scotch Collies coat offers perfect protection from the elements. With a thick, harsh top coat that guards against thorns, thistles and inclement weather and dense, water-resistant undercoat it’s one of the Collies most distinguishing features. Despite the Scotch Collies abundant coat, a weekly brush should keep it in good shape. Tangles should be eased out and are often found around the breeches, tail and rough – areas where the fur is thickest. As with all double coated breeds, expect a lot of shedding especially in spring and autumn when the dog blows its fluffy undercoat. While these shouldn’t put you off getting a Scotch Collie, it’s always worth being prepared for possible issues. The Scotch Collie is a versatile and adaptable dog, suitable as both a working dog and as a family companion. Sweet, gentle and tolerant of children, this dog encapsulates everything that an old-fashioned farm dog should be. Although numbers of this breed are low, there is a growing interest in bringing back this hard-working and family-friendly breed.